Eurotard 13736 this blouse comes with full shawl collar and is gathered at the wrists for a feminine look. 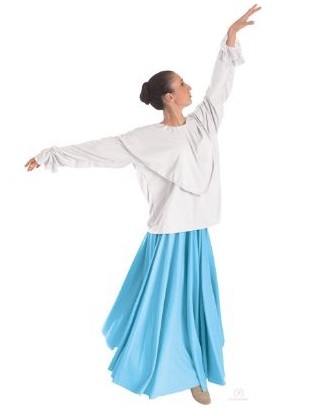 An essential top for Praise / Liturgical / Worship / Mime / Spiritual Dance wardrobe. Shown with Eurotard Triple Panel Skirt (EU 13674), sold separately.